Mood Indigo is a collaged vest made of Japanese printed Ikat cotton, with appliqués of fine wool suitings, embellished with beads, flat sequins, and irregular mother of pearl buttons. 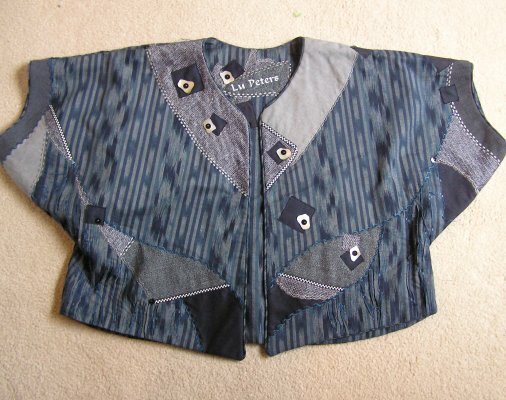 Areas of tucked fabric are contrasted with black and white “taxi” trim and are machine stitched with decorative stitches that echo the collage designs. The style of the vest suggests a Japanese influence with geometric shapes contrasting the undulating curves and irregular organic shapes. Featured in Belle Armoire issue (December 2005); Dallas Area Fiber Artists Juried Show (Eisemann Gallery, Richardson, Texas; June 2005).